Why is there a cow up the treetop? No, this is not a riddle joke. No clever punch line is expected. Nor does the answer has anything to do with a Rock-a-Bye Baby or any road-crossing chicken. This is a completely legitimate, sensible and precise question to be asked in Melbourne. 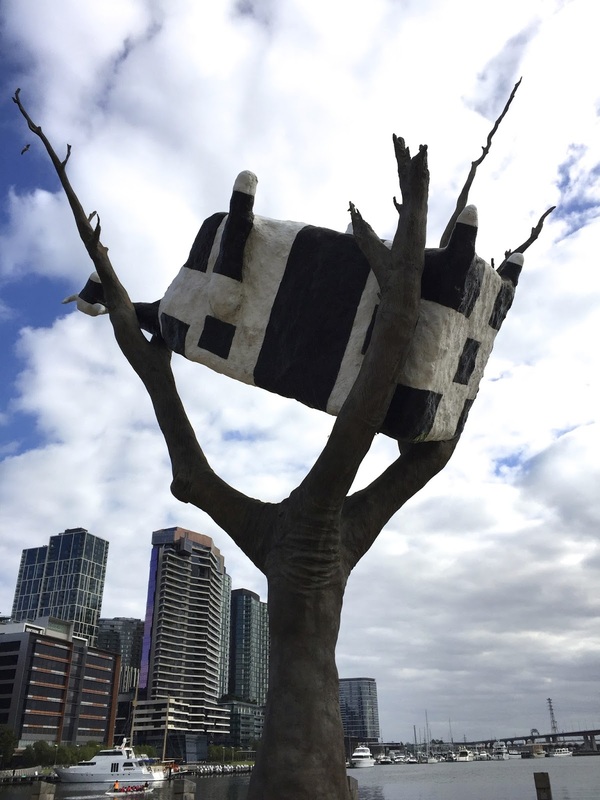 You see, along the Habour Esplanade of the Docklands precinct, there is such a cow hanging upside down on a tree in a ridiculously laughable position. A disproportionately fat body attached to long skinny neck and pointy little head, this Holstein-breed black and white dairy cow can be spotted from across the entrance of the Etihad Stadium, and is a peculiar sight unable to be missed by the Docklands tram riders. The story brings us back to the Second World War, where an artist called William Dobell was commissioned to perform an odd task of building fake cows to camouflage airfields. No one knows for sure if any of those papier mache cows were actually built, nor whether the project had successfully deceived any Japanese pilots or served any of its initial purposes. Regardless, the absurd story captured the attention of John Kelly, and triggered the whimsical sense of humour of this world-renowned Melbourne-based sculptor. After observing some photos of cattle being swept up the tree in one of those notorious flash floods in Australia, John Kelly combined the two distinct events and conceived this oddly hilarious vision of an obviously fake cow being stranded on the treetop with all four legs facing upwards. Lest there be any doubt as to the Australian-origin of the art piece, a leafless gum tree was chosen as the subject that kept the pathetic cow entangled. The 8-metre high, 4 tonnes bronze sculpture was first placed in Paris, the city of love. The silly cow caused quite a sensation in France, till a local media attributed it as the item that “puts Paris back on modern art map”. The iconic public monument later travelled its way back to the artist’s city, climbed its way up the gum tree, and resumed its permanently awkward position in the branches.